We promise to treat each pet with compassion & each pet family with Aloha! 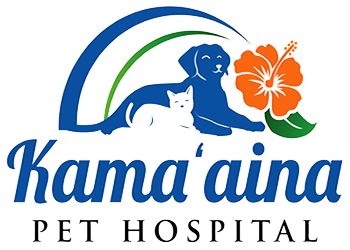 At Kama'aina Pet Hospital, our goal is to provide the community with routine and emergency veterinary care for their pets. We offer quality medical services and value for our clients. As AVMA members, our doctors strive to practice medicine within the guidelines of the American Veterinary Medical Association. With flexible hours, our hospital offers the convenience of weekend, evening, and drop off appointments. Schedule an appointment and meet our staff and veterinarians today! We promise to treat each pet with care and compassion and each family with Aloha! Appointments are available 7 days a week including Saturday and Sunday. If you have an emergency simply contact us. With extended hours our staff of experienced doctors and technicians are available to assist in the event of any pet injury or acute medical condition. Services include vaccines, wellness exams, medical diagnostics, general surgery and emergency medicine. Never pay an emergency fee before 5pm. Convenience and Dedication! We are here when you need us. We promise to treat each pet with compassion and each family with Aloha. Staffed with caring technicians and Veterinarians to provide medical treatment for your pet. Your pet will never be left alone. Our dedicated staff ensures that a Veterinarian or veterinary technician is always on-site to monitor your pet and provide proper treatment. "We absolutely love it here. We have a large pet family and they were accommodating and understanding. We couldn’t ask for better care for our fur family. Thank you kamaaina pet hospital!" "I am so HAPPY that I was referred here. I just got a new puppy and cannot be happier that I have wonderful, knowledgeable, professionals that I can completely trust. I know that my pet is in great hands by coming here!! The Docs and staff here is amazing!" "Hands down the greatest vet my wife and I have ever been to, not just in Hawaii, but everywhere. They are very loving and caring and put the time in that it takes to take care of your animals. Military friendly. If you need a new vet on the island, I highly recommend Kamaaina Pet Hospital." "Recently over the weekend, my dog was sick and really needed to be seen. With no appointment, dr. Erik told us to bring daisy in. They did fluids and watched her Saturday night. It really helped out since she didn't seem right. I can honestly say that this clinic has saved my dogs life. I would recommend this clinic. I took my dog Friday night to a clinic closer to my house but they basically said they couldn't do anything but kamaaina did a 360 with daisy. Now she is perfectly fine and running around!"